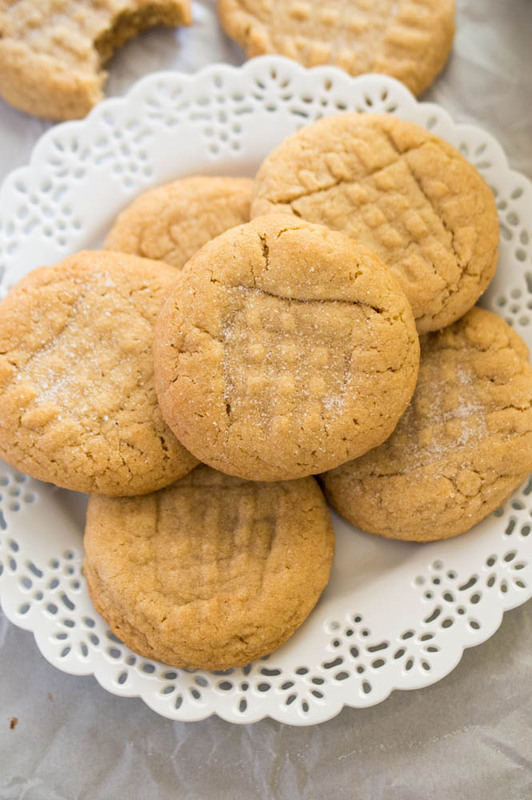 Peanut Butter Cookies are one of my favorite to eat and to prepare. They are super easy to make, come out very cute, and I always have the ingredients on hand. Peanut Butter just seems to make everything better. 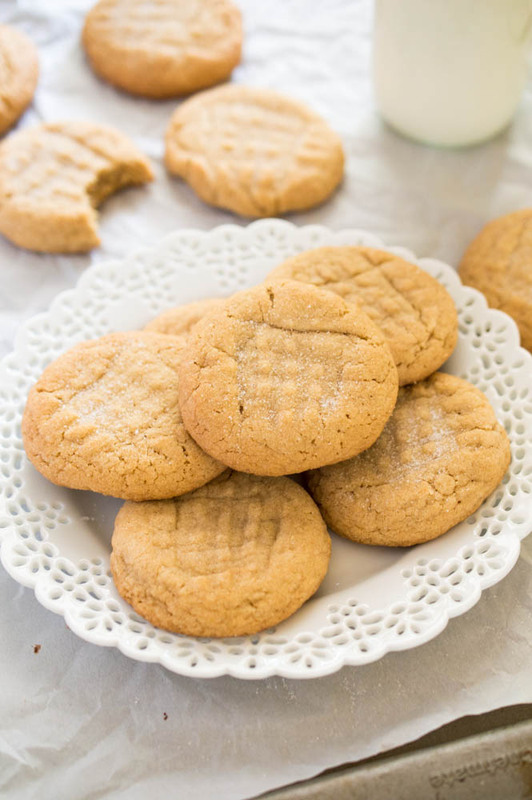 This is an old fashioned, simple, classic, no frills recipe for one of the best Chewy Peanut Butter Cookies you will ever have. Crisp and golden brown on the outside. These cookies are a beautiful cross between a peanut butter cookie and a sugar cookie. I roll the individual cookies in sugar before baking. I also sprinkle a little extra sugar after they are out of the oven. 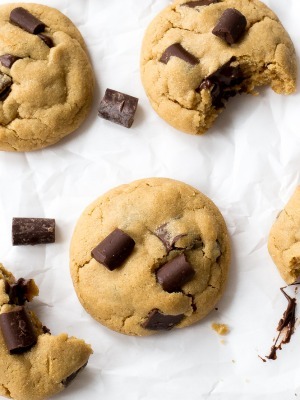 You will be eating these cookies in less than 20 minutes! If you are a fan of peanut butter like myself you will love these cookies. I slightly under baked the cookies to get the soft, chewy center. Melt in your mouth on the inside and firm on the edges. Just how I like my cookies. These cookies are made with creamy peanut butter, unsalted butter, a mix of brown and white sugar. A pinch of salt, baking soda and flour are added. I added brown sugar for a chewier texture and more flour for a thicker cookie. You will get about 16 cookies total from this recipe. 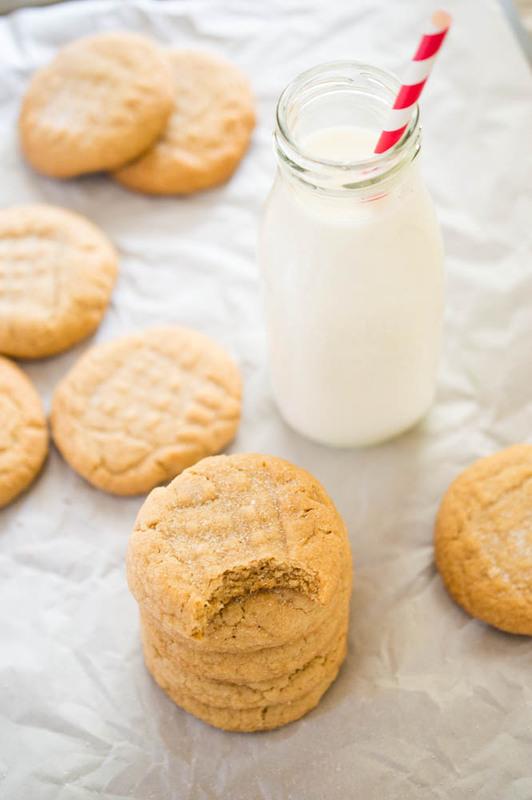 To make these Chewy Peanut Butter Cookies start by creaming butter and both sugars with a paddle attachment. Add in creamy peanut butter, a whole egg and vanilla extract. Mix again then fold in dry ingredients. Done! Portion out cookies and roll in the sugar. Place on a silicon baking mat and mark cookies with a fork for the crisscross on top. Cookies can be stored in an airtight container at room temperature for 3-5 days (if they last that long). You can always freeze the cookies for up to 3-4 months. Craving more cookies? Try my Peanut Butter Reeses and Chocolate Chip Cookies or my Nutella Chocolate Chip Cookies. View a full list of desserts here! Quick and Easy Chewy Peanut Butter Cookies. 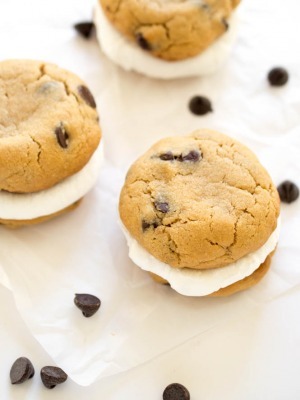 These cookies are super thick, melt in your mouth and can be made in 20 minutes! Add in peanut butter and mix for 1-2 minutes. Add in egg and vanilla. Mix until combined and clump free. Add the dry ingredients to the batter in two parts with the stand mixer on the lowest speed. Mix for a little less than a minute. Do not over mix. Portion dough into 16 cookies. Roll each cookie in the sugar and place on a silicone baking mat on top of a baking sheet. Bake cookies for 10 minutes until lightly golden brown and firm on the edges. Thank you so much Joanne! Yes classic cookies are the best! 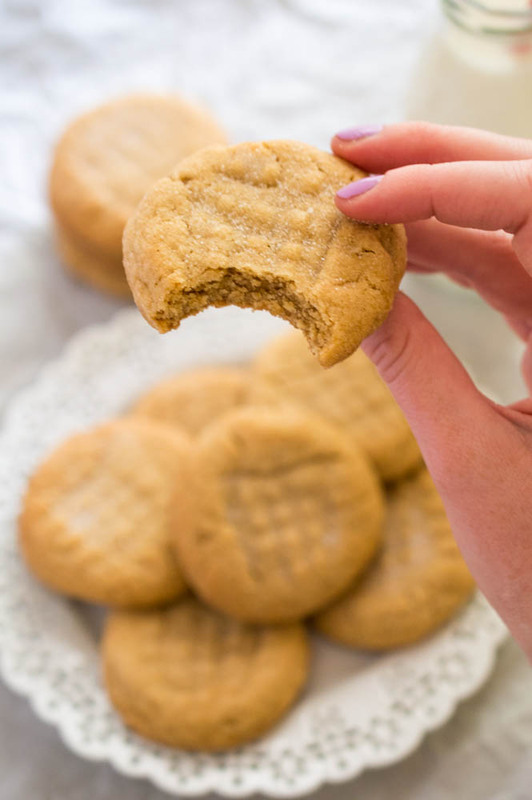 I’m such a fan of peanut butter cookies, maybe because I’m obsessed with peanut butter! 🙂 I love how chewy and fluffy these cookies look, Kelley! And any cookie that can be ready in 20 minutes is a winner in my book! Your pictures are absolutely gorgeous! Pinned! Thank you so much Gayle you are so kind! Peanut butter makes everything better! And I just can’t resist a soft cookie. These looks amazing! They look wonderful and the recipe went well until I put them in the oven!! 🙁 it took so much longer than 10 minutes for them to look even remotely done, and now it’s close to 20 minutes in the oven. I can’t tell what went wrong! Oh no! Did you press them down with the fork? Maybe they were too thick. They should take about 10-12 minutes. 20 minutes is definitely too long. Let me know so we can figure this out. Sorry about that! I have not tried to substitute coconut oil for butter in this recipe. However coconut oil usually substitutes well in baking at a 1:1 ratio. I think this should would out well but I’m afraid to tell you yes for sure because I have not tried it myself. Let me know how it works out for you. hi, do i have to roll it in sugar prior baking? i am trying to make one with less sugar actually, can’t handle too much sugar..
No it is not necessary that you roll the cookies in sugar before baking. It is OK to skip. I tested this recipe a couple of different ways so I would be afraid to change it around that it wouldn’t come out right. You can always try under baking the cookies for an extra soft and chewy center. Granulated sugar or confectioner sugar? Granulated sugar is used in this recipe. These were amazing! Omitted rolling them in sugar because I used the Skippy peanut butter with honey (didn’t want them too sweetl). The texture was just perfect (nice, fluffy and chewy on inside). These did not last long in our home, as family loved them. Thanks for sharing. I am so happy you and your family loved them Nikki!! These are delicious and flawless. I used earth balance vegan butter and separated into 18 cookies rather than 16, also cooked for 11 minutes using the middle oven rack setting. Perfection, finally after having failed with other peanut butter cookie recipes. Very tasty, highly recommended! 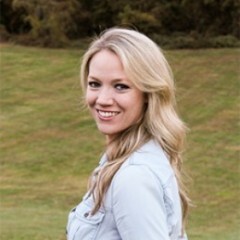 Hi Justine! I am so glad to hear you like them! Thanks! So glad you liked them Doreen!! Love the idea of adding salted peanuts. Genius! These were spot on amazing! I’ve tried making PB cookies and they always turn out hard and crumbly. These were soft and delicious! Best recipe ever! I am so glad you liked them Cori!! Thank you for the kind words! These are awful. Not really cookies- just a crumbly mess. That milk pictured with the cookies? The only way to stomach them. Otherwise it is like eating flour. I have made these numerous times and also have had tons of readers comment about how great they are. I am not sure what wrong with your batch?? Sounds like a problem with you, Zoeyka (I mean, a baking problem. Your nastiness is probably a psychological issue). This is not a complicated recipe and its very, very good. Maybe try again- it sounds like you could use a cookie. So glad you liked them Paige!! I don’t have the silicone mat for baking….have you baked them without? If so, did they come out the same? If you do not have a silicon baking sheet place them on parchment paper instead! That also works perfectly. I just finished making this recipe and with two teenagers in the house they’re already almost gone! 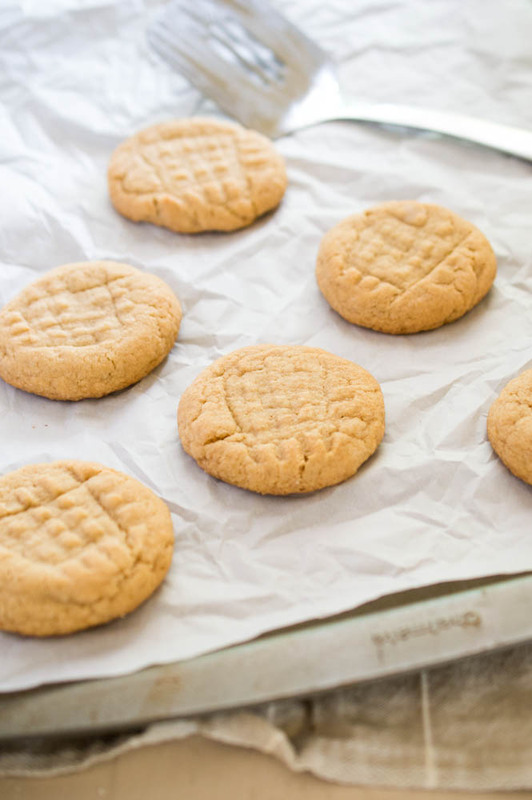 These are the best peanut butter cookies I’ve ever had and so easy to make. Thank you so much for posting your recipe. I am so glad to hear you and your family loved these cookies Danielle! 16 is not enough!! Haha! Can I double the ingredients to get double the cookies or does that change the texture and taste? I’m looking for soft and chewy and I don’t want to spoil that by doubling up. Haha I hear you! Yes you can double this recipe and it won’t affect the texture and taste. Just make sure to double everything equally. The dough does not need to be rolled out. You can roll it into cookies with your hands or a cookie scoop. I have been looking for a great pb cookie recipe for ages and this one is superb. Big PB flavour. My hubby and I differ on cookie consistency (I like a little crunch – he likes super soft and chewy) so finding a good recipe that we both love can be tough. Thank you for this. I made it to the recipe the first time through (Yummy) but now substitute margarine for butter … I lose the taste of butter, but the cookies still have lots of PB and stay soft in a ziploc bag for the whole week. The dough ends up pretty soft with the margarine so I just roll it into a fat log in kitchen wrap and chuck it in the fridge for about five minutes before cutting it into 16 pieces and baking. Anyway, thank you thank you thank you. I am so happy you guys enjoyed it Katherine!! Thanks so much for sharing!! Great recipe…they turned out perfect.Did not have silicone mat for baking sheet but used parchment paper instead. Would you recommend light or brown sugar? I would recommend using light brown sugar for these cookies. I made these today and followed the recipe to the tee including the time suggested for mixing. I was uncertain what speed I should mix the butter and sugar at because it didn’t say but medium speed worked. After baking for 10 mins, they looked undone but through experience, the way to keep it soft and chewy is not to bake it too long so I took it out anyways as the recipe says. After it cooled, it was still soft so success! Yey! Thanks for this recipe. Great recipe…exactly what I was looking for–easy, soft, chewy, vast peanut butter taste, perfect!!! Thank you & God Bless! !